I don't bake a lot of full sized cakes for a couple of reasons. It normally takes more of my time in the kitchen, and we (almost) always ended up with too much cake. But last week was special. First, because it was Valentine's day. And second, because it was J's birthday. Both on a same day. So I baked a cake, a special one to match the special day. I went with black forest cake, and took it up a notch by using this silky and melt-in-your-mouth meringue buttercream icing to cover the cake. Let me tell you this; the cake is soooo good, you will not mind the extra time and effort in the kitchen. Preheat the oven to 350 degrees F. Grease and flour two 9-inch round cake pans, line the bottom with parchment paper. In a large bowl, mix flour, cocoa powder, baking soda, baking powder and salt until well combined. Beat the butter, sugar, and vanilla in a mixing bowl until soft and creamy. Add eggs, one at the time. Add flour mixture and milk into the cream, a little at the time. Continue mixing until the batter is well mixed. Pour batter into prepared pans. Bake in the oven for 35 minutes or until toothpick inserted in the center comes out clean. Remove from the oven, transfer to the wire rack to cool slightly. Remove cakes from pans and cool completely. First, make sure that your saucepan, bowl(s) and utensils you'll use to make this icing is clean and grease free. Wash them thoroughly, dry them, wet a paper towel with some lemon juice and wipe each one of them with it to remove any excess of grease. Place egg whites, sugar and salt in a heated double boiler (or in a heatproof bowl over simmering water), whisk gently until the egg whites are hot and the sugar is completely dissolved. Transfer to a large mixing bowl. 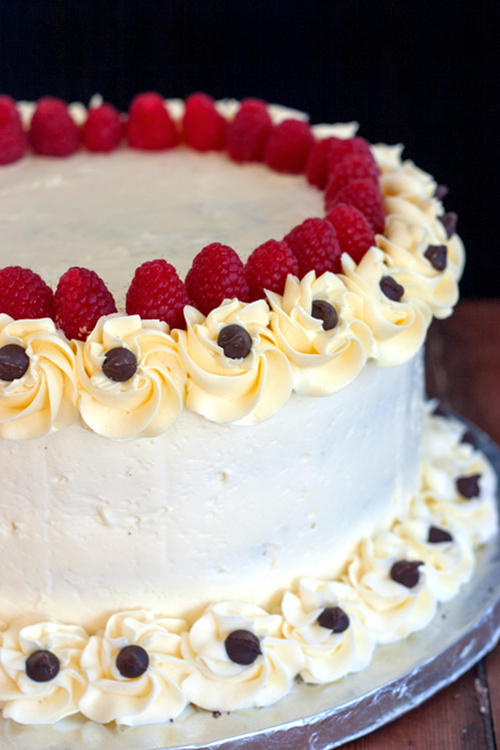 Using an electric mixer, whip the egg whites until the icing is thick and creamy. Add butter pieces into the batter, continue beating until the icing is smooth and silky. Lastly, add rum into the icing and mix well. Using a sharp serrated knife, cut the top of each take horizontally so that they're level. Cut each cake again horizontally, half way from the bottom, into two layers. Brush all 4 layers of cake with dark rum. Take 1/2 cup of icing and spread it on a layer of cake. Place 1 portion of pitted cherries evenly over the icing. Cover with another layer of cake. Repeat the process with the remaining cake, leaving the top layer without the cream and cherries. Cover the top and sides of the cake with the icing, spread the icing and smooth it using decorating spatula. Transfer the remaining icing into a piping bag with big star tip attached. Pipe the rosettes on the bottom and top parts of the cake. 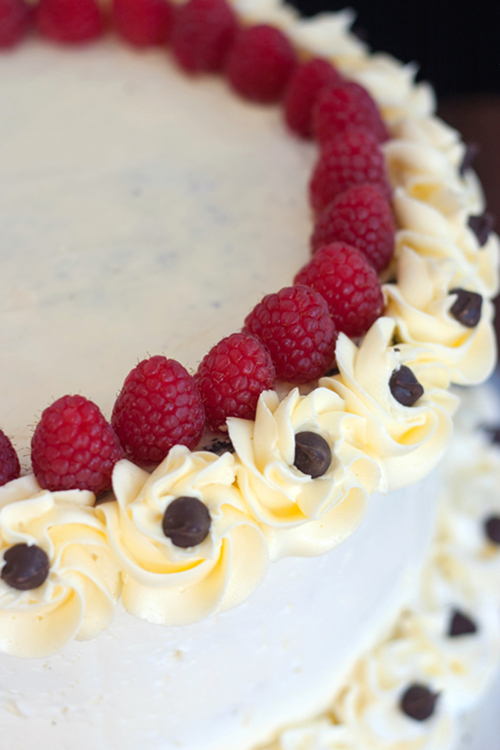 Add raspberries on top and chocolate morsels on each rosette, if desired. 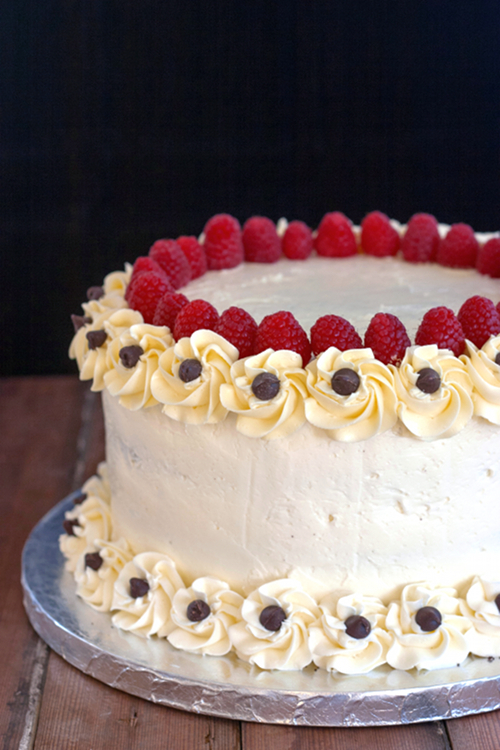 Refrigerate the cake for a few hours before serving. I missed this one! What a gorgeous cake. I'll bet it tasted fabulous! I haven't tasted the cake yet, since I finished it so late, but the frosting just tasted like butter to me. I followed the directions exactly, but I must have messed up somewhere, right? This cake takes me back to my childhood. My mom first made a Black Forest “torte” when I was about 8 years old. She made it for a dinner party she was having, but there were leftovers the next morning. I remember a thick butter cream laced with kirsch and cherries between dense, moist chocolate layers. It took so much work, that I don’t remember her ever making one again.